My regular readers may have noticed that over the past few days I slacked off on my blog. The reason for my absence from the blog (and thereby causing a lull on the facebook page and the website) was that I was visiting some old friends of mine in New York City and New Jersey. I used to be friends with them back in India (more than three decades ago) – I was in high school with one of them and in college with the other one. After all these years, both of them found me on the web – one through facebook and the second one through my blog. Sometimes, I wonder at the fast pace and the connected-ness of our world. Who would have imagined 30+ years ago that I would find these friends of mine after such a long hiatus and that too all of us would be living in different parts of the US! Anyway, I had the most wonderful time with my friends and their families. I did nothing but yack constantly, eat awesome food and drink wonderful wine for three whole days! I came back last night totally exhausted and satiated! The only problem was that while I was traveling, my resolve to try to avoid wheat and wheat products totally fell to the wayside – I just couldn’t resist all the goodies offered by the NYC restaurants. 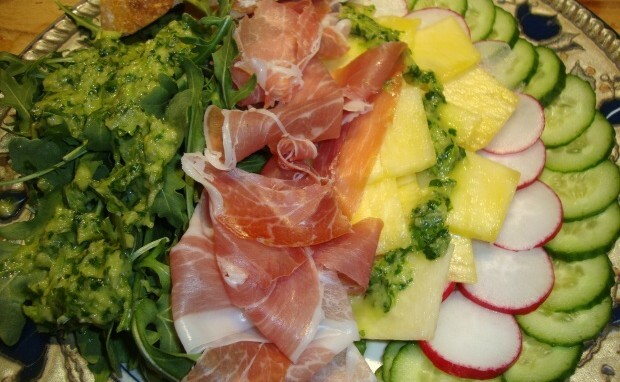 Tonight I tried to get back to some healthy eating and so I tried a delicious prosciutto salad. The combination of ham and pineapple is pretty standard but everyone uses it in baked ham and I tried it out with prosciutto. I made a pineapple-vinaigrette to top my salad and also I added some peppery arugula and radishes to give the salad some zing – it turned out magnificent! Since this was a delicious, easy to make and light meal, from now onwards, this will surely be a staple at my place! 1. 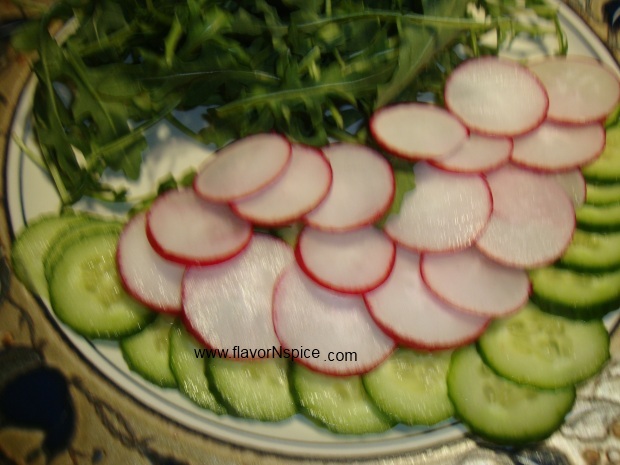 Wash the cucumber and the radishes and thinly slice both of them. If your knife skills aren’t very good, you can use a mandolin to slice them thinly. Lay then out on one side of a large dinner plate. Place the arugula on the other half of the plate. 2. 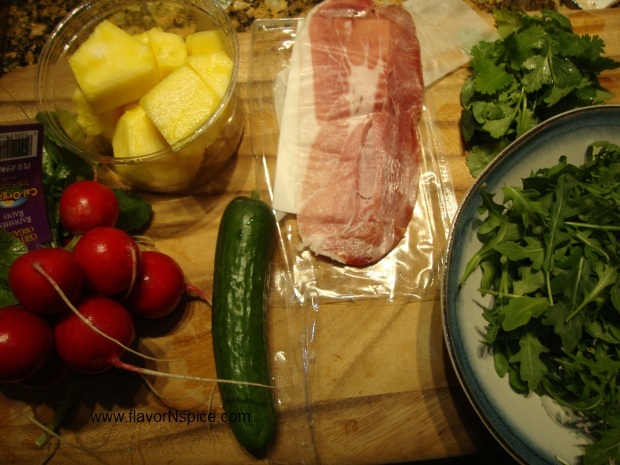 Thinly slice half of the pineapple chunks and lay then on top of the sliced radishes. 3. 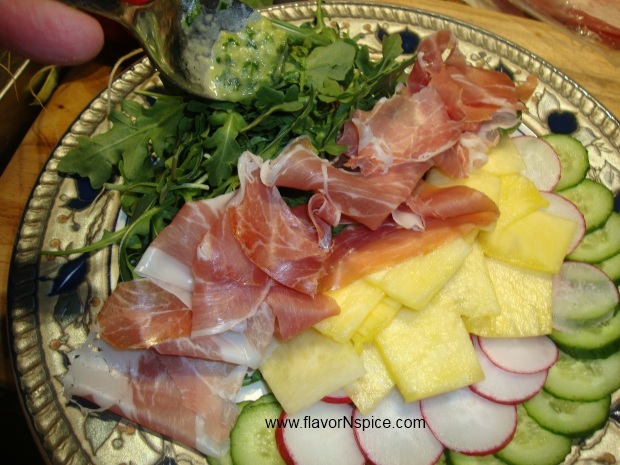 Lay out the thin slices of prosciutto in the middle of the plate (thereby separating the arugula and the cucumber, radishes and pineapple slices with the prosciutto in the middle). 4. 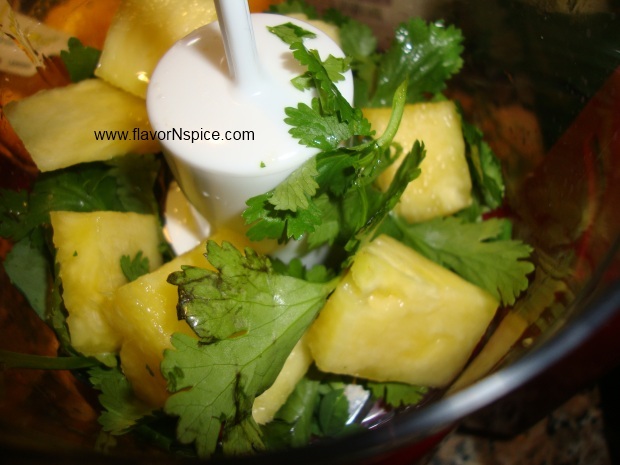 To make the vinaigrette, place the washed cilantro sprigs and the remaining amount of the pineapple in a small food processor. 5. 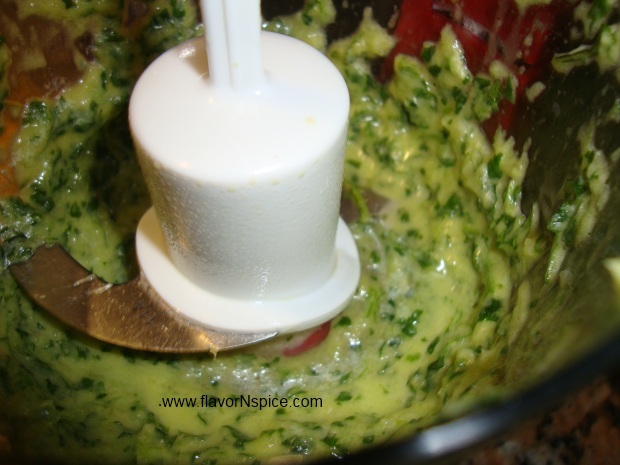 Add the Extra virgin olive oil to the food processor. 6. 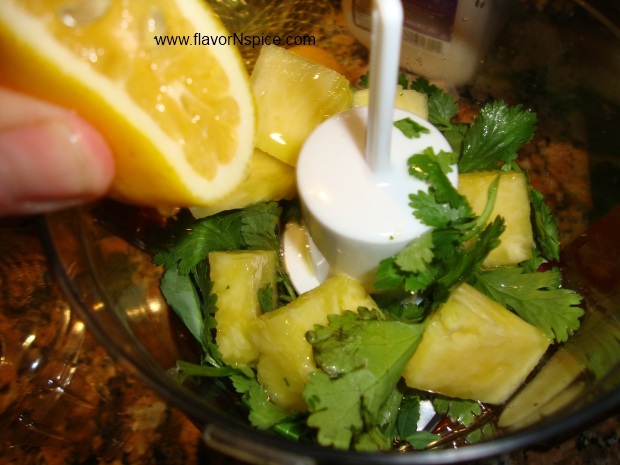 Add the juice of one Meyer lemon to the food processor (if you can find Meyer lemons, use half a regular lemon) and pulse the food processor to make a chunky vinaigrette. 7. 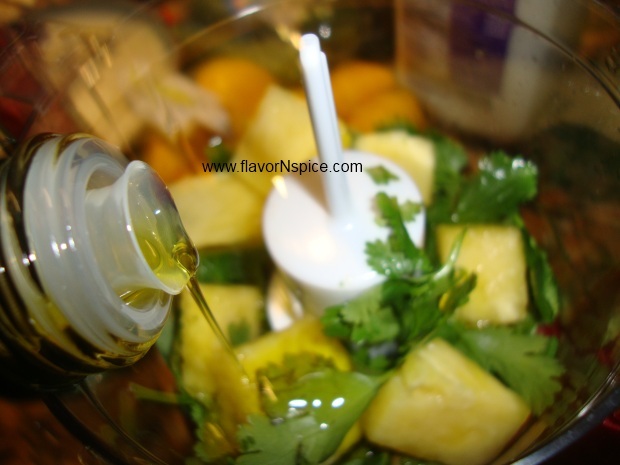 With a spoon drizzle most of the vinaigrette over the arugula leaves and a little bit over the sliced pineapple. 8. 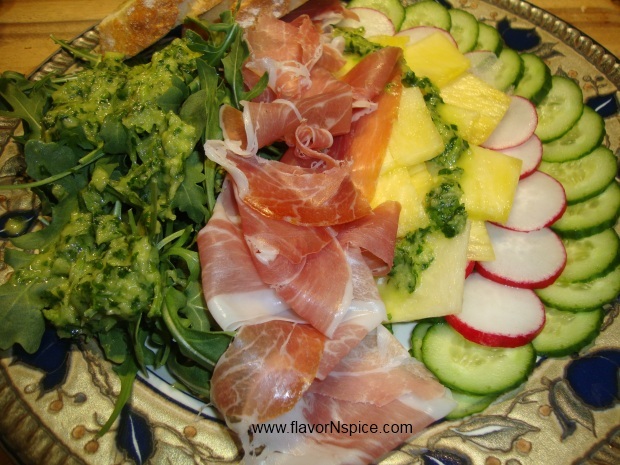 I did not add any salt to the dressing or the salad because prosciutto has a high salt content but if you need some more salt, do sprinkle some according to your preference. Serve the salad immediately (while the veggies are still crispy and delicious!). You can add a couple of slices of French bread on the side to make this a complete meal. Must try this. It might help me to imagine myself not in a blizzard! Perfect for a light meal on a hot summer day!